When I was five years old, a gorilla named Sinbad escaped from the Lincoln Park Zoo in Chicago. Aside from the assassination of President Kennedy the year before, Sinbad's escape is the earliest TV news story that I remember. Sinbad would be recaptured in short order thanks to tranquilizer darts. I don't think he even got out of the Monkey House. But the story made a deep impression on me, because I had recently been to Lincoln Park with my mother and seen Sinbad in his cage, dark, huge, and sinister. The fear that he might get out, board an El train, and come looking for me in our threeflat building was hard to shake. Gorillas in fact continually escape from zoos around the world, sometimes even dragging women with them as in the archetypal sculptures of Emmanuel Fremiet and the film King Kong. The fear that violent beasts might break out of their enclosures is, let's face it, one of the major reasons for the popularity of zoos. But despite their power and their ingenuity, gorillas actually aren't particularly violent. They are shy vegetarians, and they have no murderous or sexual designs on human beings. Gorillas are really big, though, and you would do well not to anger one. They get angry much like people do, and fight when frustrated or teased. As Douglas Adams so beautifully observed, gorillas in some moods are basically people, if hard to get to know. So the zookeeper's method of putting them in prison for life can create some even harder cases. Gorillas' fame preceded them, as Gott and Weir show. Myths of the wild man who lived somewhere on the southern margins of Western Civ permeate classical and medieval culture. The original gorillae were apes of some sort found in West Africa by Hanno of Carthage in the 400s BCE (24); well, even if they were chimpanzees, he called them "gorillae" and the name stuck. Early modern explorers found no-doubt gorillas: even if source of their own myth, they now had to answer to a reputation much elaborated in their absence. The 18th century saw gorillas as projections of the untamed beast within humans. By the 19th, some thinkers were not so sure. A famous debate broke out between Richard Owen and Thomas Henry Huxley, Owen arguing for human exceptionalism and a distant status for the gorilla, Huxley arguing that gorillas weren't far from us or us from them: gorillas more personable, humans more bestial than we'd like to think. Gott and Weir spend much time with represented gorillas, in statuary, painting, film, and comics. Some of these are frankly ridiculous. No sooner had Hollywood created King Kong than (perhaps to dispel the still-creepy effect of the matchless monster) they put guys in motheaten suits and deployed them to frighten the likes of Lou Costello or Bob Hope. Playing movie gorillas became an entire Hollywood subspecialty, and you could make very good money at it if you got the A-picture gigs and helped train other gorilla guys. But while they were conquering pop culture, gorillas remained as peacefully as ever in their native forests. Ethologists came to understand them. Dian Fossey, still a controversial figure, brought them to media prominence, fought over access to them, and died with, and for, them. Meanwhile, once the West had figured out that gorillas were actually more like large vegetarian humans than bloodthirsty movie monsters, the great apes thrived abroad too, more or less, in situations less captivity than collaboration. The most famous, Koko, is now in her 40s; she undeniably knows at least some elements of human language, paints abstract pictures, and plays with her various pet cats in what must be the most adorable pictures of two beasts ever recorded to film or digital media. 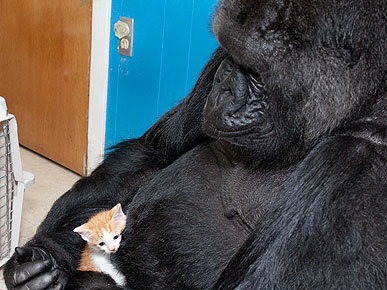 There's more than a bit of eco-schmaltz in the way Koko is marketed, but she is what she is: a very large creature with very much our own attraction to kittens. Gott, Ted, and Kathryn Weir. Gorilla. London: Reaktion, 2013.